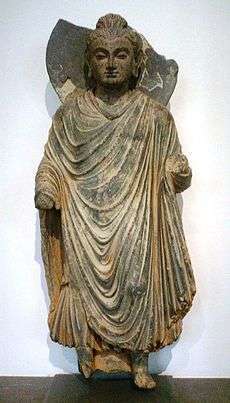 Gautama Buddha in Greco-Buddhist style, 1st-2nd century AD, Gandhara (modern eastern Afghanistan). Greco-Buddhism, or Graeco-Buddhism, is the cultural syncretism between Hellenistic culture and Buddhism, which developed between the 4th century BC and the 5th century AD in Bactria and the Indian subcontinent, corresponding to the territories of modern-day Afghanistan, Tajikistan, India, and Pakistan. It was a cultural consequence of a long chain of interactions begun by Greek forays into India from the time of Alexander the Great, carried further by his successors' establishment of the Greco-Bactrian Kingdom and, later, Indo-Greek Kingdom, and extended during the flourishing of the Kushan Empire. Buddhism was then adopted in Central and Northeastern Asia from the 1st century AD, ultimately spreading to China, Korea, Japan, Philippines, Siberia, and Vietnam. The interaction between Hellenistic Greece and Buddhism started when Alexander the Great conquered the Achaemenid Empire and further regions of Central Asia in 334 BC, crossing the Indus and then the Jhelum River after the Battle of the Hydaspes and going as far as the Beas, thus establishing direct contact with India. Alexander founded several cities in his new territories in the areas of the Amu Darya and Bactria, and Greek settlements further extended to the Khyber Pass, Gandhara (see Taxila), and the Punjab region. These regions correspond to a unique geographical passageway between the Himalayas and the Hindu Kush mountains through which most of the interaction between India and Central Asia took place, generating intense cultural exchange and trade. Following Alexander's death on June 10, 323 BC, the Diadochi or "Successors" founded their own kingdoms in Anatolia and Central Asia. General Seleucus set up the Seleucid Empire, which extended as far as India. Later, the eastern part of the Seleucid Kingdom broke away to form the Greco-Bactrian Kingdom (250 BC-125 BC), followed by the Indo-Greek Kingdom (180 BC - AD 10), and later the Kushan Empire (1st–3rd century AD). The interaction of Greek and Buddhist cultures operated over several centuries until it ended in the 5th century AD with the invasions of the Hephthalite Empire and the expansion of Islam. "Victory coin" of Alexander the Great, minted in Babylon c.322 BC, following his campaigns in India. When Alexander invaded Bactria and Gandhara, these areas may already have been under śramanic influence, likely specifically Buddhist and Jain. According to a legend preserved in the Pāli Canon, two merchant brothers from Kamsabhoga in Bactria, Tapassu and Bhallika, visited Gautama Buddha and became his disciples. The legend states that they then returned home and spread the Buddha's teaching. In 326 BC, Alexander conquered Northern region of India. 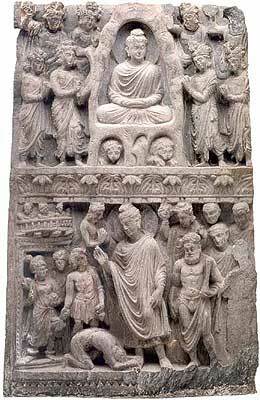 King Ambhi of Taxila, known as Taxiles, surrendered his city, a notable Buddhist center, to Alexander. Alexander fought an epic battle against King Porus of Pauravas in the Punjab, at the Battle of the Hydaspes in 326 BC. Several philosophers, such as Pyrrho, Anaxarchus and Onesicritus, are said to have been selected by Alexander to accompany him in his eastern campaigns. During the 18 months they were in India, they were able to interact with Indian ascetics, generally described as Gymnosophists ("naked philosophers"). Pyrrho (360-270 BC) returned to Greece and became the first Skeptic and the founder of the school named Pyrrhonism. The Greek biographer Diogenes Laërtius explained that Pyrrho's equanimity and detachment from the world were acquired in India. Few of his sayings are directly known, but they are clearly reminiscent of śramanic, possibly Buddhist, thought: "Nothing really exists, but human life is governed by convention. ... Nothing is in itself more this than that"
Another of these philosophers, Onesicritus, a Cynic, is said by Strabo to have learnt in India the following precepts: "That nothing that happens to a man is bad or good, opinions being merely dreams. ... That the best philosophy [is] that which liberates the mind from [both] pleasure and grief". The Indian emperor Chandragupta Maurya, founder of the Maurya Empire, re-conquered around 322 BC the northwest Indian territory that had been lost to Alexander the Great. However, contacts were kept with his Greco-Iranian neighbours in the Seleucid Empire. Emperor Seleucus I Nicator came to a marital agreement as part of a peace treaty, and several Greeks, such as the historian Megasthenes, resided at the Mauryan court. 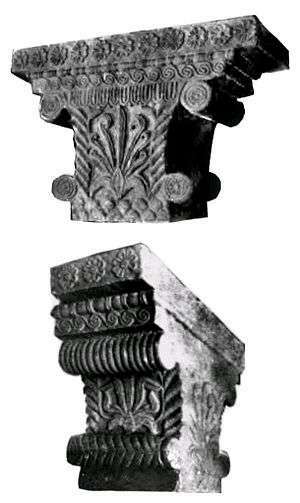 The Hellenistic Pataliputra capital, discovered in Pataliputra, capital of the Maurya Empire, dated to the 3rd century BCE. Chandragupta's grandson Ashoka embraced the Buddhist faith and became a great proselytizer in the line of the traditional Pali canon of Theravada Buddhism, insisting on non-violence to humans and animals (ahimsa), and general precepts regulating the life of lay people. The conquest by Dharma has been won here, on the borders, and even six hundred yojanas (4,000 miles) away, where the Greek king Antiochos (Antiyoga) rules, and beyond there where the four kings named Ptolemy (Turamaya), Antigonos (Antikini), Magas (Maka) and Alexander (Alikasu[n]dara) rule, likewise in the south among the Cholas, the Pandyas, and as far as Tamraparni. 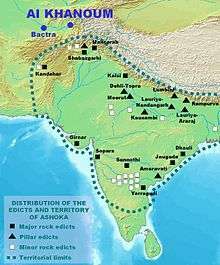 Finally, some of the emissaries of Ashoka, such as the famous Dharmaraksita, are described in Pali sources as leading Greek ("Yona") Buddhist monks active in Buddhist proselytism (the Mahavamsa, XII), founding the eponymous Dharmaguptaka school of Buddhism. The Greco-Bactrian city of Ai-Khanoum (c.300-145 BC) was located at the doorstep of India. The Greco-Bactrians maintained a strong Hellenistic culture at the door of India during the rule of the Maurya Empire in India, as exemplified by the archaeological site of Ai-Khanoum. When the Maurya Empire was toppled by the Shunga Empire around 180 BC, the Greco-Bactrians expanded into India, where they established the Indo-Greek Kingdom, under which Buddhism was able to flourish. 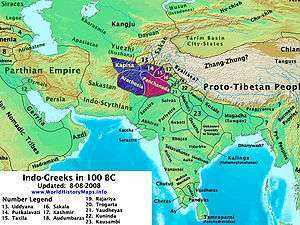 The Greco-Bactrians conquered parts of North India from 180 BC, whence they are known as the Indo-Greeks. They controlled various areas of the northern Indian territory until AD 10. 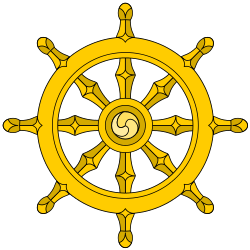 Buddhism prospered under the Indo-Greek kings, and it has been suggested that their invasion of India was intended to protect the Buddhist faith from the religious persecutions of the Shungas (185–73 BC), who had overthrown the Mauryans. Zarmanochegas was a śramana (possibly, but not necessarily a Buddhist) who, according to ancient historians such as Strabo, Cassius Dio and Nicolaus of Damascus traveled to Antioch and Athens while Augustus (died AD 14) was ruling the Roman Empire. 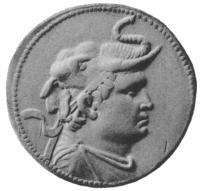 Silver coin depicting the Greek king Demetrius I of Bactria wearing an elephant scalp, symbol of his conquest of India in 180 BC. The coins of the Indo-Greek king Menander I (reigned 160-135 BC), found from Afghanistan to central India, bear the inscription "Saviour King Menander" in Greek on the front. Several Indo-Greek kings after Menander, such as Zoilos I, Strato I, Heliokles II, Theophilos, Peukolaos, Menander II and Archebius display on their coins the title "Maharajasa Dharmika" (lit. "King of the Dharma") in Prakrit written in Kharoshthi. Some of the coins of Menander I and Menander II incorporate the Buddhist symbol of the eight-spoked wheel, associated with the Greek symbols of victory, either the palm of victory, or the victory wreath handed over by the goddess Nike. According to the Milinda Pañha, at the end of his reign Menander I became a Buddhist arhat, a fact also echoed by Plutarch, who explains that his relics were shared and enshrined. A coin of Menander I (r.160-135 BC) with a dharmacakra and a palm. The ubiquitous symbol of the elephant in Indo-Greek coinage may also have been associated with Buddhism, as suggested by the parallel between coins of Antialcidas and Menander II, where the elephant in the coins of Antialcidas holds the same relationship to Zeus and Nike as the Buddhist wheel on the coins of Menander II. When the Zoroastrian Indo-Parthian Kingdom invaded North India in the 1st century AD, they adopted a large part of the symbolism of Indo-Greek coinage, but refrained from ever using the elephant, suggesting that its meaning was not merely geographical. 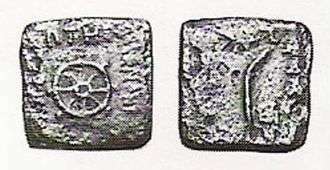 Vitarka Mudra gestures on Indo-Greek coinage. Top: Divinities Tyche and Zeus. 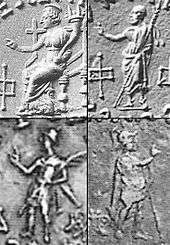 Bottom: Depiction of the Indo-Greek kings Nicias and Menander II. Finally, after the reign of Menander I, several Indo-Greek rulers, such as Amyntas Nikator, Nicias, Peukolaos, Hermaeus, Hippostratos and Menander II, depicted themselves or their Greek deities forming with the right hand a benediction gesture identical to the Buddhist vitarka mudra (thumb and index joined together, with other fingers extended), which in Buddhism signifies the transmission of Buddha's teaching. According to Ptolemy, Greek cities were founded by the Greco-Bactrians in northern India. Menander established his capital in Sagala (modern Sialkot, Punjab, Pakistan) one of the centers of the blossoming Buddhist culture. A large Greek city built by Demetrius and rebuilt by Menander has been excavated at the archaeological site of Sirkap near Taxila, where Buddhist stupas were standing side-by-side with Hindu and Greek temples, indicating religious tolerance and syncretism. Evidence of direct religious interaction between Greek and Buddhist thought during the period include the Milinda Pañha or "Questions of Menander", a Pali-language discourse in the platonic style held between Menander I and the Buddhist monk Nagasena. 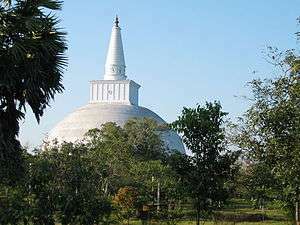 According to the Mahavamsa, the Ruwanwelisaya in Anuradhapura, Sri Lanka, was dedicated by a 30,000-strong Yona delegation from Alexandria on the Caucasus around 130 BC. The Mahavamsa, ch. 29, records that during Menander's reign, a Greek thera (elder monk) named Mahadharmaraksita led 30,000 Buddhist monks from "the Greek city of Alexandria" (possibly Alexandria on the Caucasus, around 150 kilometres (93 mi) north of today's Kabul in Afghanistan), to Sri Lanka for the dedication of a stupa, indicating that Buddhism flourished in Menander's territory and that Greeks took a very active part in it. Several Buddhist dedications by Greeks in India are recorded, such as that of the Greek meridarch (civil governor of a province) named Theodorus, describing in Kharosthi how he enshrined relics of the Buddha. The inscriptions were found on a vase inside a stupa, dated to the reign of Menander or one of his successors in the 1st century BC. Finally, Buddhist tradition recognizes Menander as one of the great benefactors of the faith, together with Ashoka and Kanishka the Great. Buddhist manuscripts in cursive Greek have been found in Afghanistan, praising various Buddhas and including mentions of the Mahayana figure of "Lokesvararaja Buddha" (λωγοασφαροραζοβοδδο). These manuscripts have been dated later than the 2nd century AD. The Kushan Empire, one of the five tribes of the Yuezhi, settled in Bactria around 125 BC, displacing the Greco-Bactrians and invading the northern parts of Pakistan and India from around AD 1. By that time they had already been in contact with Greek culture and the Indo-Greek kingdoms for more than a century. They used the Greek script to write their language, as exemplified by their coins and their adoption of the Greek alphabet. The absorption of Greek historical and mythological culture is suggested by Kushan sculptures representing Dionysiac scenes or even the story of the Trojan Horse and it is probable that Greek communities remained under Kushan rule. Hellenistic culture in the Indian subcontinent: Greek clothes, amphoras, wine and music. Detail from Chakhil-i-Ghoundi Stupa, Hadda, Gandhara, 1st century AD. The Kushan king Kanishka, who honored Zoroastrian, Greek and Brahmanic deities as well as the Buddha and was famous for his religious syncretism, convened the Fourth Buddhist council around AD 100 in Kashmir in order to redact the Sarvastivadin canon. Some of Kanishka's coins bear the earliest representations of the Buddha on a coin (around AD 120), in Hellenistic style and with the word "Boddo" in Greek script. Kanishka also had the original Gandhari Prakrit Mahāyāna sūtras translated into Sanskrit, "a turning point in the evolution of the Buddhist literary canon"
The Kanishka casket, dated to the first year of Kanishka's reign in AD 127, was signed by a Greek artist named Agesilas, who oversaw work at Kanishka's stupas (cetiya), confirming the direct involvement of Greeks with Buddhist realizations at such a late date. 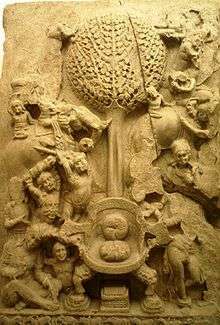 An aniconic representation of Mara's assault on the Buddha, 2nd century AD, Amaravathi village, Guntur district, India. Although there is still some debate, the first anthropomorphic representations of the Buddha himself are often considered a result of the Greco-Buddhist interaction. Before this innovation, Buddhist art was "aniconic": the Buddha was only represented through his symbols (an empty throne, the Bodhi Tree, Buddha footprints, the Dharmachakra). This reluctance towards anthropomorphic representations of the Buddha, and the sophisticated development of aniconic symbols to avoid it (even in narrative scenes where other human figures would appear), seem to be connected to one of the Buddha’s sayings reported in the Digha Nikaya that discouraged representations of himself after the extinction of his body. Probably not feeling bound by these restrictions, and because of "their cult of form, the Greeks were the first to attempt a sculptural representation of the Buddha". In many parts of the Ancient World, the Greeks did develop syncretic divinities, that could become a common religious focus for populations with different traditions: a well-known example is Serapis, introduced by Ptolemy I Soter in Egypt, who combined aspects of Greek and Egyptian Gods. In India as well, it was only natural for the Greeks to create a single common divinity by combining the image of a Greek god-king (Apollo, or possibly the deified founder of the Indo-Greek Kingdom, Demetrius I of Bactria), with the traditional physical characteristics of the Buddha. Standing Buddha, Gandhara, 1st century AD. 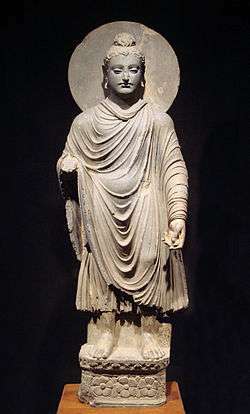 Many of the stylistic elements in the representations of the Buddha point to Greek influence: himation, the contrapposto stance of the upright figures (see: 1st–2nd century Gandhara standing Buddhas, the stylized curly hair and ushnisha apparently derived from the style of the Apollo Belvedere (330 BC) and the measured quality of the faces, all rendered with strong artistic realism. A large quantity of sculptures combining Buddhist and purely Hellenistic styles and iconography were excavated at the modern site of Hadda, Afghanistan. The curly hair of Buddha is described in the famous list of the physical characteristics of the Buddha in the Buddhist sutras. The hair with curls turning to the right is first described in the Pāli canon; we find the same description in the Dāsāṣṭasāhasrikā prajñāpāramitā. Greek artists were most probably the authors of these early representations of the Buddha, in particular the standing statues, which display "a realistic treatment of the folds and on some even a hint of modelled volume that characterizes the best Greek work. This is Classical or Hellenistic Greek, not archaizing Greek transmitted by Persia or Bactria, nor distinctively Roman." 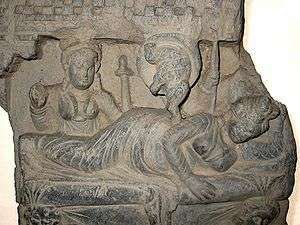 One of the distinguishing features of the Gandharan school of art that emerged in north-west India is that it has been clearly influenced by the naturalism of the Classical Greek style. Thus, while these images still convey the inner peace that results from putting the Buddha's doctrine into practice, they also give us an impression of people who walked and talked, etc. and slept much as we do. I feel this is very important. These figures are inspiring because they do not only depict the goal, but also the sense that people like us can achieve it if we try. Herculean depiction of Vajrapani (right), as the protector of the Buddha, 2nd century AD Gandhara, British Museum. Several other Buddhist deities may have been influenced by Greek gods. For example, Heracles with a lion-skin, the protector deity of Demetrius I of Bactria, "served as an artistic model for Vajrapani, a protector of the Buddha" (See). In Japan, this expression further translated into the wrath-filled and muscular Niō guardian gods of the Buddha, standing today at the entrance of many Buddhist temples. A Buddhist coin of Kanishka I, with legend ΒΟΔΔΟ "Boddo" (=the Buddha) in Greek script on the reverse. According to Katsumi Tanabe, professor at Chūō University, Japan, besides Vajrapani, Greek influence also appears in several other gods of the Mahayana pantheon such as the Japanese Fūjin, inspired from the Greek divinity Boreas through the Greco-Buddhist Wardo, or the mother deity Hariti inspired by Tyche. Blue-eyed Central Asian monk teaching East-Asian monk. 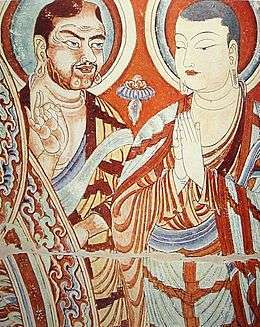 A fresco from the Bezeklik Thousand Buddha Caves, dated to the 9th or 10th century (Kara-Khoja Kingdom). Greek monks played a direct role in the upper hierarchy of Buddhism, and in its early dissemination. 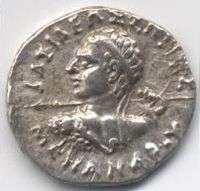 During the rule (165 BC - 135 BC) of the Greco-Bactrian King Menander I (Pali: "Milinda"), Mahadharmaraksita (literally translated as 'Great Teacher/Preserver of the Dharma') was "a Greek (Pali: Yona, lit. Ionian) Buddhist head monk," according to the Mahavamsa (Chap. XXIX), who led 30,000 Buddhist monks from "the Greek city of Alasandra" (Alexandria of the Caucasus, around 150 km north of today's Kabul in Afghanistan), to Sri Lanka for the dedication of the Great Stupa in Anuradhapura. Dharmaraksita (Sanskrit), or Dhammarakkhita (Pali) (translation: Protected by the Dharma), was one of the missionaries sent by the Mauryan emperor Ashoka to proselytize the Buddhist faith. He is described as being a Greek (Pali: "Yona", lit. "Ionian") in the Mahavamsa, and his activities are indicative of the strength of the Hellenistic Greek involvement during the formative centuries of Buddhism. Indeed, Menander I was famously converted to Buddhism by Nagasena, who was a student of the Greek Buddhist monk Dharmaraksita. Menander is said to have reached enlightenment as an arhat under Nagasena's guidance and is recorded as a great patron of Buddhism. The dialogue of the Greek king Menander I (Pali "Milinda") with the monk Nagasena comprises the Pali Buddhist work known as the Milinda Panha. Two half-brothers from Gandhara, Asanga and Vasubandhu (4th century), created the Yogacara or "Mind-only" school of Mahayana Buddhism, which through one of its major texts, the Lankavatara Sutra, became a founding block of Mahayana, and particularly Zen, philosophy. 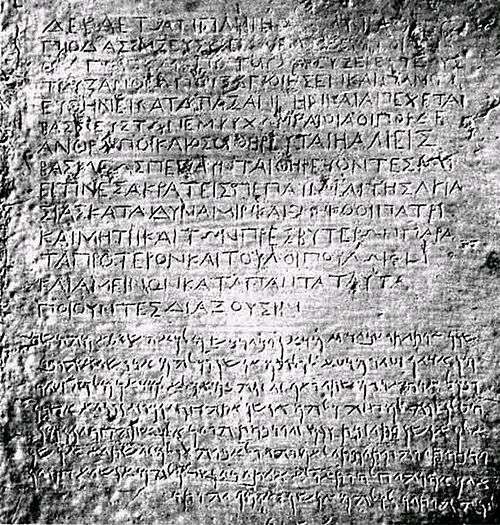 Bilingual edict (Greek and Aramaic) 3rd century BC by Indian Buddhist King Ashoka, see Edicts of Ashoka, from Kandahar. This edict advocates the adoption of "godliness" using the Greek term Eusebeia for Dharma. Kabul Museum. Intense westward physical exchange at that time along the Silk Road is confirmed by the Roman craze for silk from the 1st century BC to the point that the Senate issued, in vain, several edicts to prohibit the wearing of silk, on economic and moral grounds. This is attested by at least three authors: Strabo (64/ 63 BC–c. 24 AD), Seneca the Younger (c. 3 BC–AD 65), Pliny the Elder (23–79 AD). The aforementioned Strabo and Plutarch (c. 45–125 AD) also wrote about Indo-Greek Buddhist king Menander, confirming that information about the Indo-Greek Buddhists was circulating throughout the Hellenistic world. Zarmanochegas (Zarmarus) (Ζαρμανοχηγὰς) was a monk of the Sramana tradition (possibly, but not necessarily a Buddhist) who, according to ancient historians such as Strabo and Dio Cassius, met Nicholas of Damascus in Antioch while Augustus (died AD 14) was ruling the Roman Empire, and shortly thereafter proceeded to Athens where he burnt himself to death. His story and tomb in Athens were well-known over a century later. Plutarch (died AD 120) in his Life of Alexander, after discussing the self-immolation of Calanus of India (Kalanos) witnessed by Alexander writes: "The same thing was done long after by another Indian who came with Caesar to Athens, where they still show you 'the Indian's Monument,'" referring to Zarmanochegas' tomb in Roman Athens. Another century later the Christian church father Clement of Alexandria (died AD 215) mentioned Buddha by name in his Stromata (Bk I, Ch XV): "The Indian gymnosophists are also in the number, and the other barbarian philosophers. And of these there are two classes, some of them called Sarmanæ and others Brahmins. And those of the Sarmanæ who are called "Hylobii" neither inhabit cities, nor have roofs over them, but are clothed in the bark of trees, feed on nuts, and drink water in their hands. Like those called Encratites in the present day, they know not marriage nor begetting of children. Some, too, of the Indians obey the precepts of Buddha (Βούττα) whom, on account of his extraordinary sanctity, they have raised to divine honours." Buddhist gravestones from the Ptolemaic period have also been found in Alexandria in Egypt, decorated with depictions of the Dharma wheel. The presence of Buddhists in Alexandria at this time is important, since "It was later in this very place that some of the most active centers of Christianity were established". The pre-Christian monastic order of the Therapeutae is possibly a deformation of the Pāli word "Theravāda," a form of Buddhism, and the movement may have "almost entirely drawn (its) inspiration from the teaching and practices of Buddhist asceticism". They may even have been descendants of Asoka's emissaries to the West. The philosopher Hegesias of Cyrene, from the city of Cyrene where Magas of Cyrene ruled, is sometimes thought to have been influenced by the teachings of Aśoka's Buddhist missionaries. Queen Māyā's white elephant dream, and the conception of the Buddha. Gandhara, 2-3rd century AD. One theory is that these similarities may indicate the propagation of Buddhist ideals into the Western World, with the Greeks acting as intermediaries and religious syncretists. "Scholars have often considered the possibility that Buddhism influenced the early development of Christianity. They have drawn attention to many parallels concerning the births, lives, doctrines, and deaths of the Buddha and Jesus" (Bentley, "Old World Encounters"). The story of the birth of the Buddha was well known in the West, and possibly influenced the story of the birth of Jesus: Saint Jerome (4th century AD) mentions the birth of the Buddha, who he says "was born from the side of a virgin," and the influential early Christian church father Clement of Alexandria (died AD 215) mentioned Buddha (Βούττα) in his Stromata (Bk I, Ch XV). ↑ Narain, A.K. (1976). The Coin Types of the Indo-Greek Kings, 256-54 B.C. Ares. ISBN 0-89005-109-7. ↑ Hans Erich Stier, Ernst Kirsten, Ekkehard Aner. Grosser Atlas zur Weltgeschichte: Vorzeit. Altertum. Mittelalter. Neuzeit. Georg Westermann Verlag 1978, ISBN 3-14-100919-8. 1 2 Strabo, XV.I.65: "Strabo XV.1". Perseus.tufts.edu. Retrieved 2010-09-01. ↑ For an English translation of the Greek edicts: Religions and Trade: Religious Formation, Transformation and Cross-Cultural Exchange between East and West. BRILL. 2 December 2013. pp. 65–. ISBN 978-90-04-25530-2. 1 2 Strabo, xv, 1, on the immolation of the Sramana in Athens (Paragraph 73). 1 2 Dio Cassius, liv, 9. ↑ Thomas McEvilley (7 February 2012). The Shape of Ancient Thought: Comparative Studies in Greek and Indian Philosophies. Constable & Robinson. pp. 558–. ISBN 978-1-58115-933-2. ↑ Tarn, William Woodthorpe (24 June 2010). The Greeks in Bactria and India. Cambridge University Press. p. 391. ISBN 978-1-108-00941-6. ↑ Nicholas Sims-Williams, "A Bactrian Buddhist Manuscript"
↑ 14th Dalai Lama, foreword to "Echoes of Alexander the Great", 2000. ↑ Katsumi Tanabe, Alexander the Great: East-West Cultural Contact from Greece to Japan (Tokyo: NHK Puromōshon and Tokyo National Museum, 2003). ↑ Broughton, Jeffrey L. (1999), The Bodhidharma Anthology: The Earliest Records of Zen, Berkeley: University of California Press, ISBN 0-520-21972-4. pp. 54-55. Alexander the Great: East-West Cultural Contacts from Greece to Japan. Tokyo: NHK Puromōshon and Tokyo National Museum, 2003. Georgios T. Halkias, “When the Greeks Converted the Buddha: Asymmetrical Transfers of Knowledge in Indo-Greek Cultures”, in Trade and Religions: Religious Formation, Transformation and Cross-Cultural Exchange between East and West, ed. Volker Rabens. Leiden: Brill, 2013, p. 65–115.